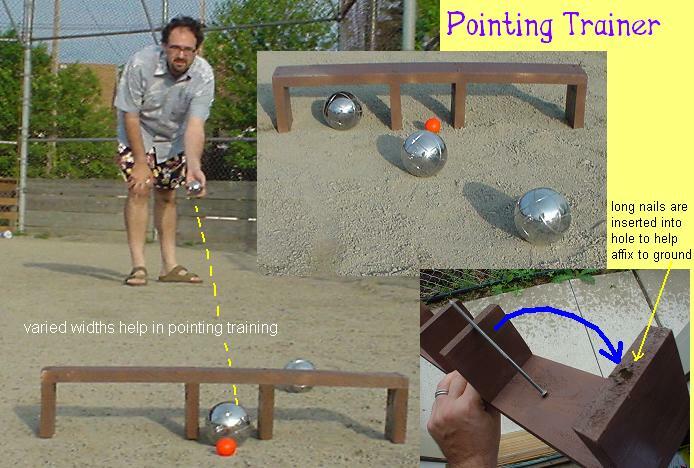 I love weird and/or ingenious devices that are designed to help you practice petanque. In this post, I gather together a few pictures of the most interesting kind of device, the automatic boule return (ABR) machine. ABR machines fall into four basic categories, based (a) on whether the target boule is fixed in place or can be shot away, and (b) whether the machine uses gravity or an electrice motor to return boules to the player. The most basic design for an ABR machine uses a fixed target and gravity to return thrown boules to the player. 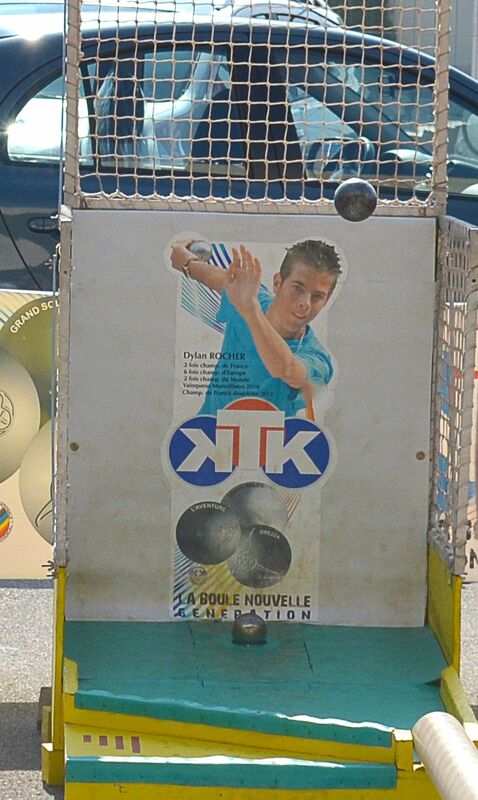 In 2007, the Midwest Petanque Alliance had a post about this machine, which was for sale on eBay France. Description: Very nice machine for a Petanque club which returns shot boules. A target boule is attached by a cable to the center of the shooting piste. The machine takes note of the force of the shots, and displays them on a screen (1,2 or 3) while returning the shooting boule to the player. Here is another machine of the same type. In the lower right-hand corner of the photo, you can see the entrance to the gravity-feed boule-return tube. Perhaps this was built as a promotional tool for KTK. CLICK to see larger image. I built my own gravity-powered ABR machine. The boule backstop was a heavy old carpet. I would throw as hard as I could and the carpet absorbed it easily, so I would practice throwing as hard as I could. The most ingenious design for a gravity-powered ABR that I know of, is Jeff Brown’s Boule-O-Matic 3000. Here is a video of an ABR machine (which calls itself a BAR machine, for “boule automatic return”) in Wateringen, the Netherlands. 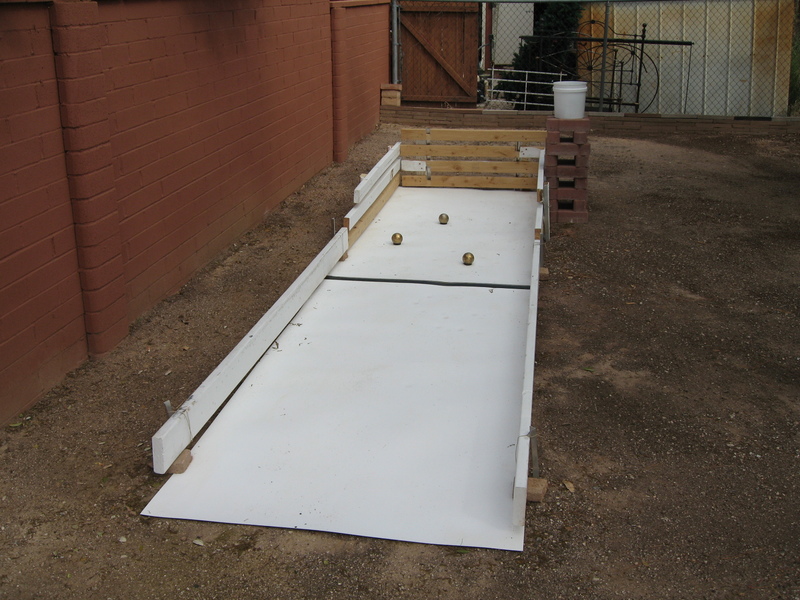 This device uses an electric motor to lift the thrown boules and return them, like the ball return machines in American bowling alleys. The target boule is fixed in place. If you are a Facebook member, click on the picture and you can watch a short video of the machine in action. This is a picture taken, I believe, at the Marathon booth at the SEA games in Thailand. Marathon is a Thai manufacturer of sports and fitness equipment, including petanque boules. Most ABR machines have a target boule that is fixed in place. This machine, however, allows you to knock the target boule out of position. 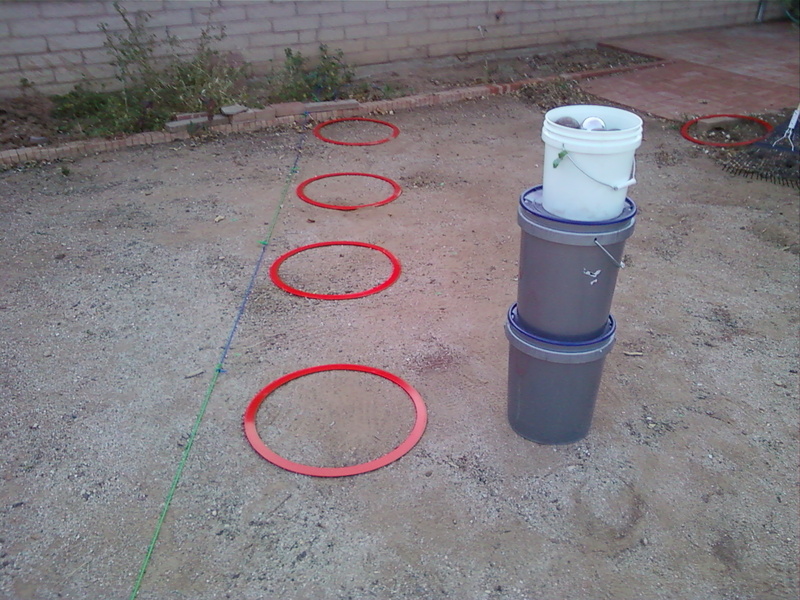 When you do, both the thrown boule and the target boule are returned via the yellow tube on the right. To replace the target boule that has been displaced, the player takes one of the boules that has been returned to him and feeds it back toward the head via the yellow tube on the left, which neatly rolls the boule into position to become a new target. There is no machinery involved in the process; gravity does all of the work. CLICK to see larger image. 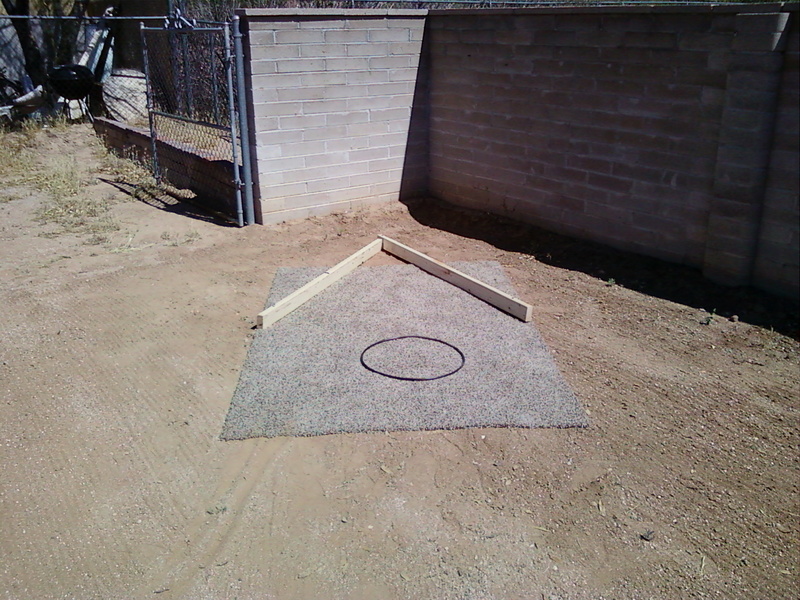 There is a similar machine called the Petanque Shooting Trainer, or PST. Unlike the previous machine (but like the ABR in the Netherlands) the PST uses powered machinery to return boules to the player. The PST returns both thrown boules and displaced target boules along a track (the upper track). To replace the target boule, a player takes one of the returned boules and sends it back to the machine via the lower track. 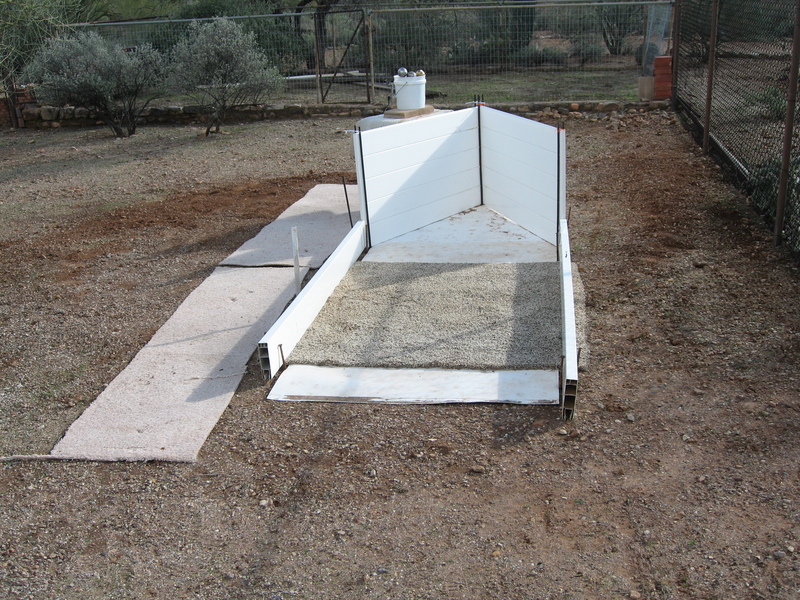 The machine then feeds the boule up through the floor of the device, putting it into place as a new target boule. The PST was developed by an Australian player named Martial Leconte, who built the first prototype in his back yard in 2007. Later he and another Australian player built a second prototype and took it on an exhibition tour of pétanque events in Europe. In the summer of 2016 the device was exhibited in several events in France, and tested by a number of well-known shooters— videos are available on Youtube and on the PST Facebook page. PST has announced that a new model will be presented on tour in the summer of 2018, and that the Rocher family website may become distributors of the device in France. So that’s my collection of ABR machines. If you have photos or information about other automatic boule return machines, please leave a comment. I like toys. 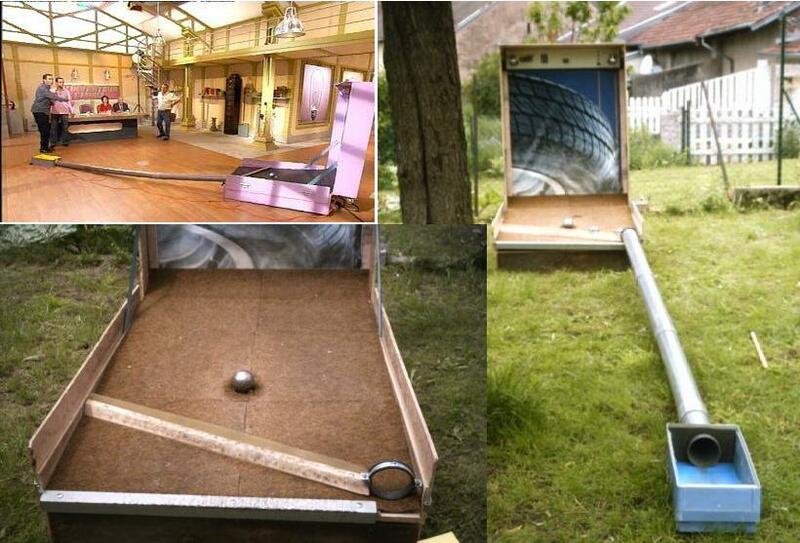 I’m fascinated by ideas for devices to help with petanque practice. … but now I think it must be a “petanque-ified” version of a traditional French game called boule à la pente (ball up the slope). 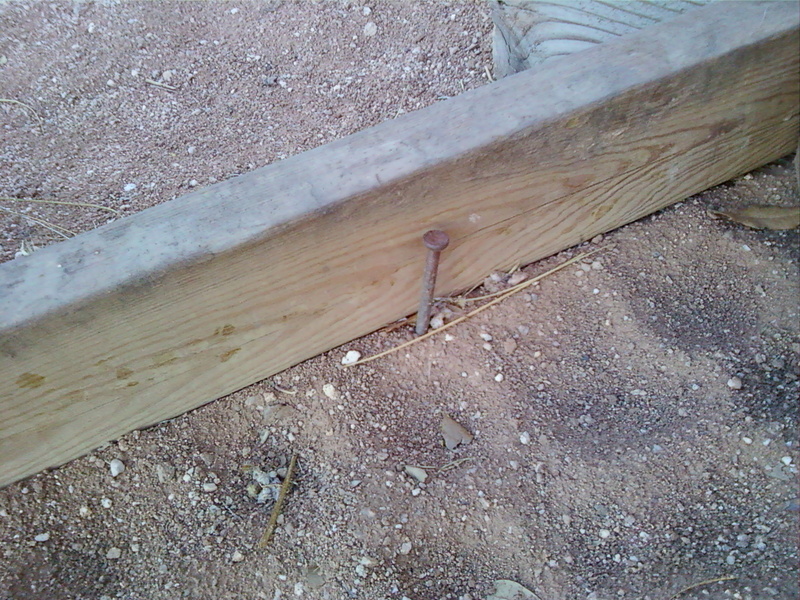 The goal is apparently to get balls into the holes in the board. A similar game, called bumble puppy (also known as “nine holes”), was a popular pub game in England in the late 1700s. 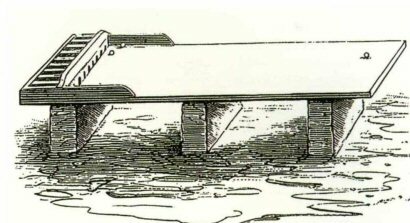 Here is an illustration of it being played in 1803. Another English game also called “bumble puppy” involved rolling round playing pieces down a slanting board toward nine compartments. This is a variant of a very old game that is known to have existed since at least 1530. In France in the 17th century it was known as trou madame. It was played with balls or rolling disks, either on the ground or on a table-top. You can see a similar device for playing trou madame at the left in the photo of boule à la pente (above). This next device looks like a game of trou madame played on the ground with petanque boules, but… it might be a device for practicing pointing. See this YouTube video of Festival de Pétanque Düsseldorf 2010, where it appears briefly at about 4:30. It’s an easy transition from trou madame to pointing-practice device. 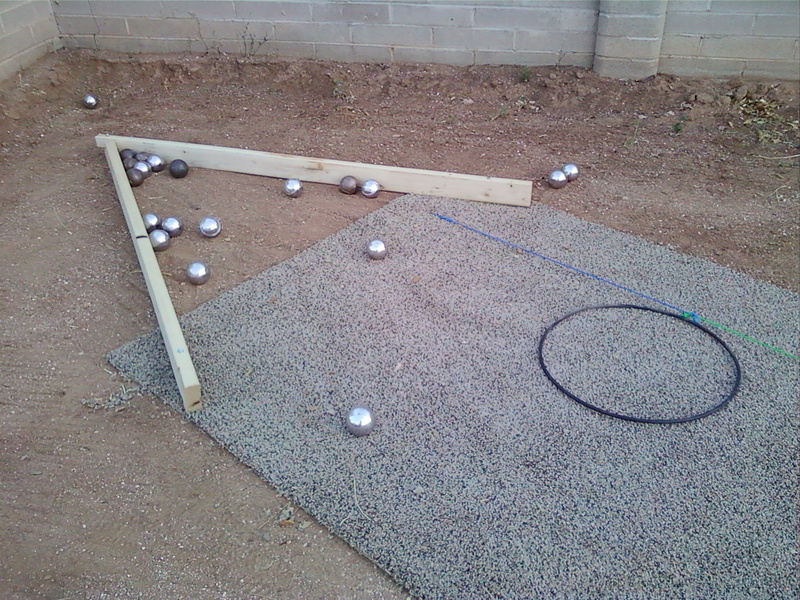 I found this home-made device on the Midwest Petanque Alliance web site. Here is a very sturdy version of the same idea. You can buy it from a German company for only 400 euros. The same Germany company also offers shooting training devices that automatically pull a shot boule back into place, allowing you immediately to shoot at it again. In this particular device, the target boule is suspended from a cross-bar. This device allows you to attach 1, 2, or 3 target boules to it via springs. It might be for use in Shooting a Back Boule competitions (see below). I don’t understand why these devices cost hundreds of Euros when you can easily build something similar for a few dollars. I tied a whiffle ball ($5 at my local Ace hardware store) to a length of bungee cord. It works great. 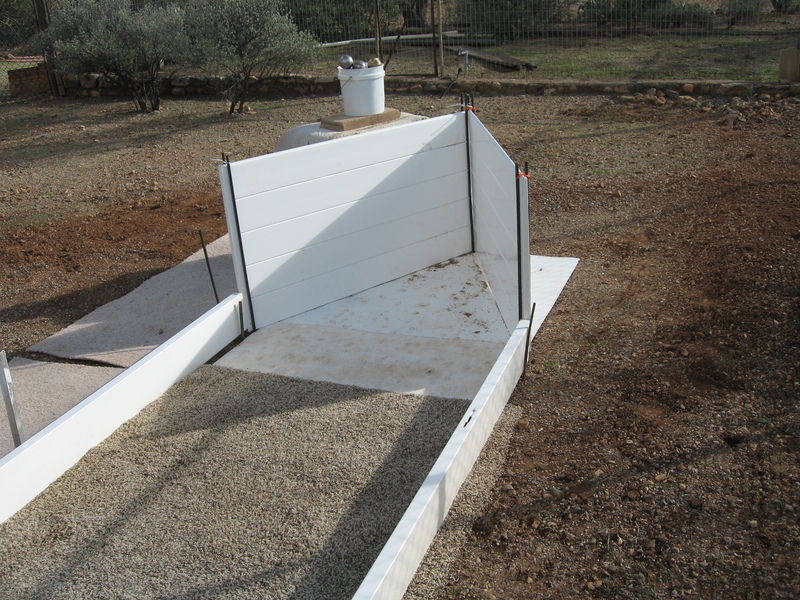 A simple device to assist in practicing shooting au fer is a barrier in front of the target boule. 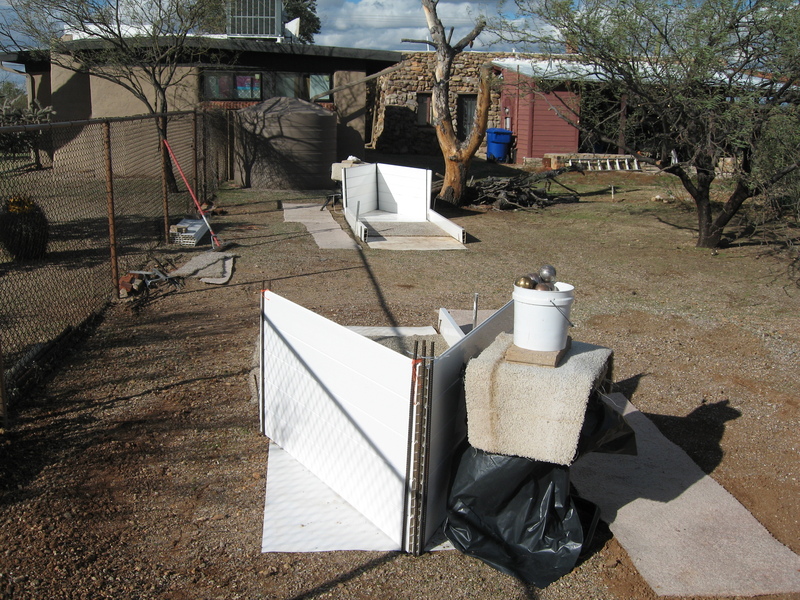 Here, in a shooting workshop at the Tucson Petanque Club, the barriers are 8′ 2x4s, cut in half, with the halves duct-taped together. Two of the strangest devices I’ve seen are these. In this 2009 video their inventor, Louis Amour, shows them in action. They are actually rather neat devices for drawing the target circle (cible) and positioning the target balls for a precision-shooting contest. 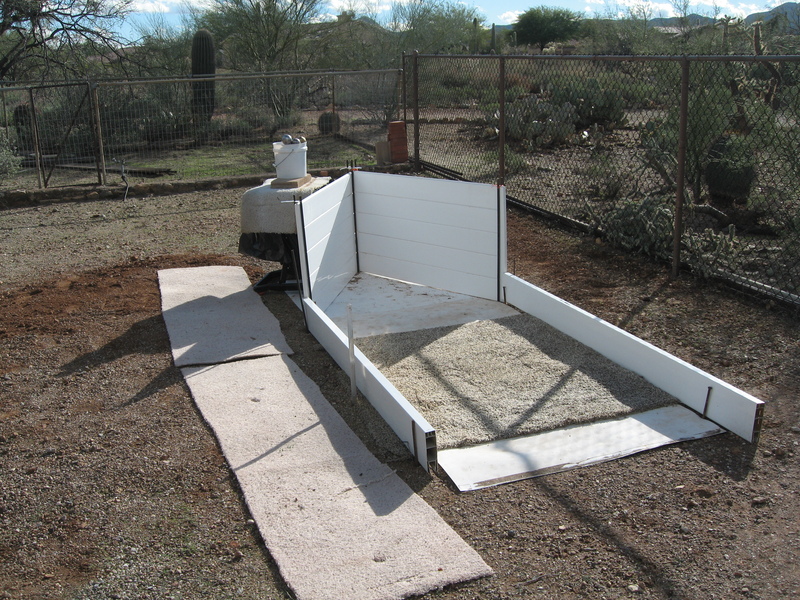 Here are pictures of a couple of similar devices that appeared in 2007 on the blog of the Midwest Petanque Alliance. They look like they might be early prototypes made by Louis Amour. 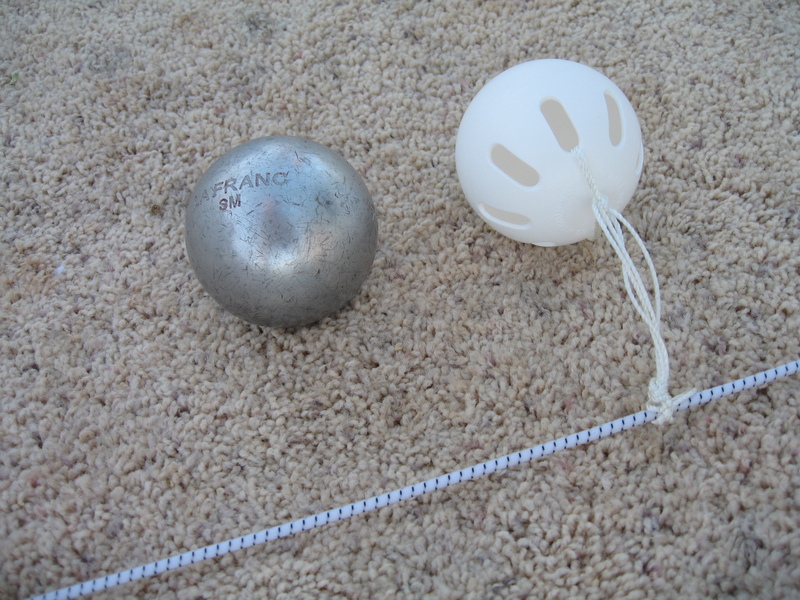 Another device of this type is available at PetanqueShop.com, while an elegant version (see below) is available at the Rocher family website. Here is a Youtube video demonstrating a similar tool. Skip to about 2:20 to see the actual demonstration. 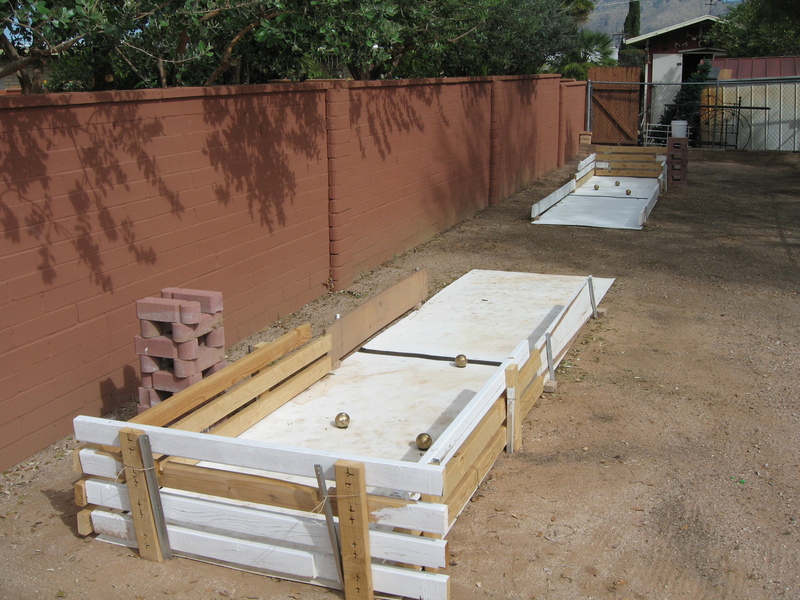 On the Facebook page of the Zanesfield Petanque Club Bo Johns provided a picture of his “indoor shooting pit”. 6) You're all set for winter practices. Here is a newer version of the same idea. Is that home plate? Or a shooting pit? Here’s a tip from Joe Acchiardi, of La Boule Joyeuse in Maryland— use old baseballs as practice targets. A baseball is about the right size, and you won’t bang up any of your real boules by using them as practice targets. And if you succeed with a nice tir au baseball you don’t get the loud THWOK that you’d get with a boule. That means that you can practice quietly in your own back yard without irritating the neighbors with the noise. 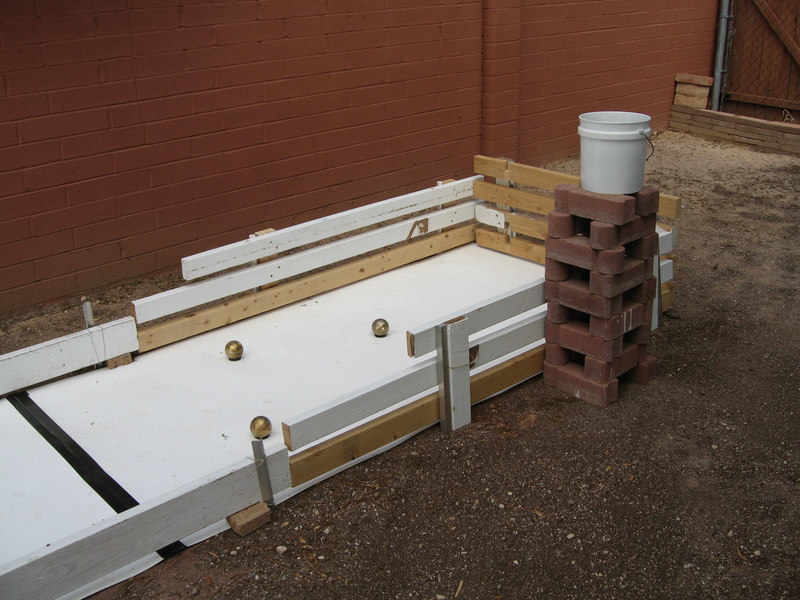 A simple wooden bench placed near to the jack can be a useful device for training in lobbing. The red arrow in this photo of a Japanese training session points to the thrown boule, which is dropping nearly vertically onto the target. When Marco Foyot runs training classes he uses frames and crossbars made of PVC pipe— the same basic idea.